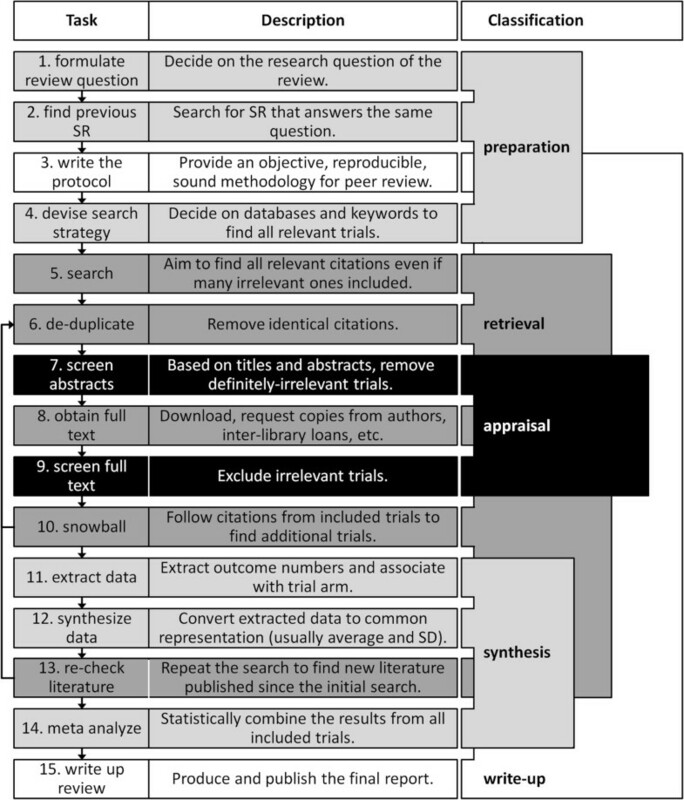 Resources and processes for writing and publishing systematic reviews and meta-analyses. (2) provides examples of search strategies used for your topic or for parts of your topic. NOTE: You should also search for other types of studies on your topic to make sure there is enough literature to conduct a systematic review. For example, for intervention or therapy studies, for which randomized controlled trials are the gold standard in terms of evidence, you want to find at least a few RCT's on your topic to make sure a full systematic review is feasible. II. It is strongly recommended that you register your review with PROSPERO to help make sure the same search question wasn't / isn't being investigated by others and that no one else will start a systematic review on this topic while you're conducting one. PRISMA stands for Preferred Reporting Items for Systematic Reviews and Meta-Analyses. It is an evidence-based minimum set of items for reporting in systematic reviews and meta-analyses. The PRISMA Statement consists of a 27-item checklist and a four-phase flow diagram (available as PDF files in the right-hand column). The official document that describes in detail the process of preparing and maintaining Cochrane systematic reviews on the effects of healthcare interventions. The IOM recommends 21 standards for developing high-quality systematic reviews of comparative effectiveness research. The standards address the entire systematic review process from the initial steps of formulating the topic and building the review team to producing a detailed final report that synthesizes what the evidence shows and where knowledge gaps remain. For example: In patients with type 2 diabetes, does a low-carbohydrate diet or a low-fat diet improve metabolic control and quality of life? Decide which databases to search: general biomedical databases (PubMed/MEDLINE, Scopus/EMBASE, CINAHL), subject-specific databases (PsycINFO, ERIC), and/or grey literature (ClinicalTrials.gov, Conference Proceedings Index, Dissertations). Develop a list of keywords and subject headings for each concept in your question. Search engines are only as smart as you tell them to be! You will have to think of all the synonyms that could be used to describe each concept in your question, because different authors may use different terms for the same condition or population (e.g. heart attack / myocardial infarction / cardiovascular stroke). HINT: Use the Concept Table to help construct your list of terms. Computers operate using mathematical language, so you will have to combine your search terms in a certain order (using AND, OR, NOT), use quotes around phrases, parentheses around separate concepts, truncation symbols, etc. For each database searched, save the exact search strategy used, date of search, and number of results. Save the list of results in Excel format (XLS, TXT) and/or the format required for your citation management progam (EndNote, Zotero). For more information about these programs, check out our Citation Management guide. Read this first! Helpful tips on how to keep track of your searches and manage your citations. Use these forms to better define your own research question and search strategy. Formulate your question in PICO format and come up with initial search terms for each concept. Record which databases to search and list keywords/subject headings for each concept in your research question. Determine which type of studies will provide the best answer to your research question. Determine the level of evidence of a particular study based on its methodology. A protocol checklist and flow diagram from PRISMA. A helpful checklist to use when formulating your study protocol. Article explaining the PRISMA protocol method. A flow diagram for recording your references. Plug in your search and screening results and this software will create the diagram for you! Contact a librarian if you would like some help searching for information on your topic or tracking down the full text of an article. That's why we're here! A librarian will search relevant databases for articles, guidelines and other information on your topic. Request the full text of a specific article from our document delivery office. NOTE: Step 14 is for researchers performing meta-analyses only.